We’re very excited to announce the release of the next major update Power Tools, Power Tools 2.0. Power Tools has again been upgraded to include a new major feature of the Colour Palette, an expanded Shapes Gallery, no-admin install requirements, and many more minor feature upgrades. We’ve also redesigned the software architecture to improve speed and stability. Seamless colour changes with the Colour Palette. 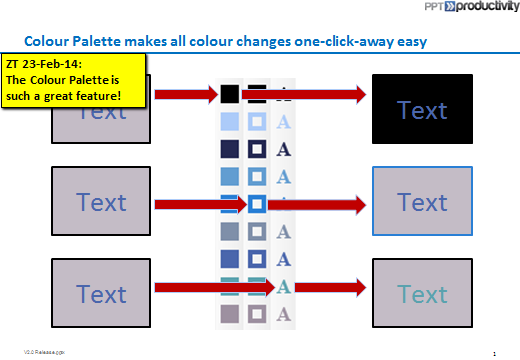 Changing fill colour, line colour and text colour are all now one click away, making it even easier to ensure consistency in corporate colours, as well as simply making sure your slides look great. The Shapes Gallery has been boosted with over twice as many pre-set shapes. These new shapes are based on tried and true top-tier management consulting designs for effective communication, including “Vertical Column” and “Horizontal Box” designs. We’ve been hard at work on our code architecture, streamlining and simplifying our software. You’ll never actually notice, and that’s how it should be. Our software is now even better at getting out of your way and ‘just working’, with improved speed and stability, and no admin restrictions for installation. You asked and we’ve delivered – we’ve packed in a few more minor feature upgrades, like the suite of Notes tools. Now you can quickly add a sticky note object to track commentary, and then quickly scroll through stickies to find you and your colleagues’ previous commentary. Finally, remove all stickies with one click right before going to print or sending. Perfect for big teams collaborating on the same presentation!